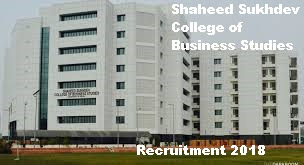 In the Shahid Sukhdev College of Business Studies (SSBCBS), inviting applications for the recruitment of 15 vacant posts of Appointing Officer, Programmer, Senior Technical Assistant, Junior Assistant. Interested candidates can apply before the deadline by reading the given instructions. The last date for applying is 24 November 2018. Candidates for these positions will be selected on the basis of interview and experience. Apply soon – 15 vacant posts of Appointing Officer, Programmer, Senior Technical Assistant, Junior Assistant. Interested candidates can apply before the deadline by reading the given instructions. The last date for applying is 24 November 2018. Candidates for these positions will be selected on the basis of interview and experience. intersted candiate apply soon for this job.